I love to read! It’s not that I don’t enjoy a fun movie with the family (especially with popcorn generously sprinkled with peanut or plain M&Ms), but for me, reading is the luxury I can never seem to afford time-wise as much as I would like. So, when I get a chance to relax in our recliner (which my wife usually beats me to, and, honestly, she works much harder for that privilege) or to unwind in a nice, hot tub, a book is often my companion. Since I was not a reader when I was young (I was a book “viewer” so long as it had lots of pictures), I suppose I’m probably making up for it subconsciously. From time to time on this blog, I would like to share my thoughts about a book I’ve read with some good personal finance lessons, tips, suggestions, and/or stories that I think others would benefit from and, more importantly, enjoy. So, today, I’d like to take you back a few years to your own childhood. One of my favorite books to “read” as a child was The Bears’ Vacation (pub. 1968). To this day, if I see a twig poking just above the surface of a pond or creek, I smilingly assume there’s a dangerous sunken log just belong the ripples. 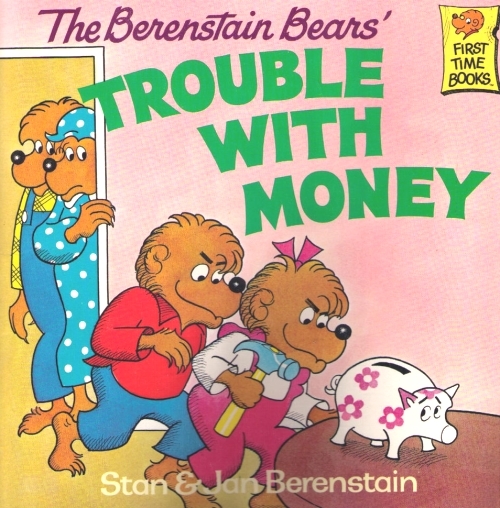 Fortunately for my own children, the Berenstain Bears are still around and Papa Bear is still teaching important lessons through his own mistakes or just plain ol’ goofiness. I actually use this book when I go into Kindergarten through 3rd Grade classes for readings. The kids know what money is and how to spend it (like Brother and Sister Bear), but the idea of earning it or saving it is still pretty foreign. So it keeps my visits interesting to them. The story’s lesson is fitting for all children: Money is for more than just spending. Kids of just about any age can earn and save it. The book introduces the idea that Moms and Dads are pretty normal for worrying about money but that their kids are even more important to their parents than money is. Balsa wood airplanes and the Astro video game? This fun personal finance book for kids comes with time travel options for their parents. None really, although being an equal opportunity saver, I would have been tickled to see (even though the book was published way back in 1983) a reference to the valuable services of both banks AND credit unions… but I know that’s stretching things. I love them both! If you don’t give allowance to your kids, or if they never receive money from grandparents or for birthdays, be prepared for that discussion. Papa Bear and Grizzly Gramps tend to spoil the cubs with cash donations. What do you know how to do that your friends, neighbors or others would be willing to pay you for? Pet minding, yard work, lemonade, etc. Kids in early elementary school need to learn that their efforts have value to others and that they CAN SELL products and services to others. “Papa was so startled and so embarrassed at having been so wrong about them, that he was speechless.” Kids love this reaction, especially if you read it and go speechless yourself. Seems silly, but for a class of 7-year-olds, it’s hilarious. Have fun with it! I highly recommend this Berenstain Bears story. I hope you can enjoy reading it soon to a little one cuddled up on your own lap or snuggled deep into their own covers. Have a beary wonderful day! Do You Have Suggestions on the Financial Books I Should Review Next? Also, if you need more information on improving your personal finances, please feel free to reach out and our financial counselors will assist you!